Guest post by Mike Corak (@mikecorak) who oversees strategic planning, Web development, and marketing services for Tempe, Arizona integrated agency Off Madison Ave.
Are your customers telling you everything you need to know to improve the bottom line? Conducting primary market research and audience research, and purchasing secondary studies are fundamental ways communicators inform and align their efforts to produce relevant results. Obvious. While amazingly helpful and unquestionably valuable, beyond simple surveys, the downside is that this type of research is often expensive and time consuming to produce. In the fast-paced, economically suppressed world we currently live in, it’s not uncommon for organizations to roll the dice and move forward without this knowledge. That’s a mistake, and while everyone knows results are at risk, budgets are budgets. Wish you could afford to sharpen your communications through customer understanding? And obtain actionable tips quickly on a budget? It’s your lucky day. This post will show you how to learn more about your customers than you do now to improve your communications efforts all by digging into data you already have or have access to. So What Exactly is This Data I Speak Of? Just as the internet has changed the way we communicate and interact, the data tracked has presented an opportunity for market research professionals to adjust their methodologies for the better. One of the benefits, and slightly disturbing nuances of the internet, is that all activity is recorded. Search engines, social networking sites, results from your promotions and testing (email activity, customer reaction to banner ads, etc) and analytics from your own website for that matter, hold unbelievable gems of knowledge that you can utilize immediately to improve the relevance of your integrated communications. Bottom line – if you know how to tap into and mine these sources for trends, you can learn a great deal about your target audiences without ever having to bribe a single stranger that might match the profile. My friend Jeff Herzog of iCrossing fame and ZooLoo (what exactly is ZooLoo Jeff anyway?) used to say “search is the world’s largest focus group.” I’m not sure if he authored the phrase, but regardless, I’ll always remember it and give him credit. Why? If you compare the 14.3 billion searches conducted in March 2009 per comScore to the response pool of any survey or focus group, you can quickly understand which set may provide more value. Of course, not everyone is searching for the topic you may be interested in, but it’s extremely likely that more people are searching for your topic of interest versus the number of subjects in your research partner’s database. By categorizing search phrases and ranking groupings by popularity, in this case, it was easy to discover what true product demand looked like online and understand consumer vernacular. The company we performed this particular research for changed website vernacular, navigation, product names and categorization to better align with their consumer’s interests, and the results spoke for themselves. There isn’t an organization in existance that wouldn’t benefit from improved consumer relevance, the real mission of employing research. A way to enhance the findings of linguistic studies like the above is to examine search phrase popularity over time. On a high-level, many sites and reporters use this information to report on the latest in pop culture interest. Beyond providing Perez Hilton with the necessary ammunition for his next rant, trending data is extremely useful for gaining a better understanding of seasonality and changes in consumer interest over time. Overlaying the efforts of campaigns, press mentions and the like can also help you understand the effect of your integrated communications efforts. Free tools like Facebook Lexicon offer glimpses at searches on Facebook. 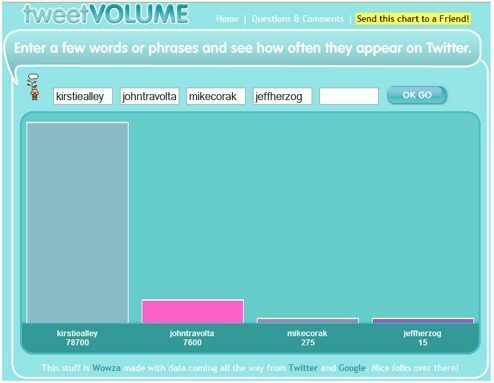 TweetVolume allows you to compare searches for various phrases – looks like I have you covered Jeff, Kirstie and John, now look who’s talking! Google Trends is even more useful for general market research as more people search Google for information than any other site ever. Example, when looking at the Google Trends report above for Kirstie Alley, yes, we’re really going there, you see a large spike in late 2006. I know you’re thinking that must have been the buzz-worthy release to BluRay date of “Look Who’s Talking Too,” but surprisingly, it’s not, as explained by the backup information on the right of the graph – the Oprah effect, imagine that. These tools are also a PR pros dream, and the findings apply both online and offline as they represent general interest. Maybe the most informative way to listen to your customers is through your own site’s search software. Understanding what terms your visitors are using here can help you identify popular vernacular, the associated quantity can help qualify demand, and this data also is informative when thinking about plussing up the usefulness and usability of your website. There’s literally thousands of ways to mine consumer data online to inform your integrated communications efforts. What tools do you use? How do they inform your decisions? Are you doing it at all?